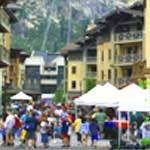 From Old Mammoth Road, to Main Street and into The Village, Mammoth has some great places to shop. You can stroll the Art Galleries on Old Mammoth Road, buy ski clothes or even shop at our famous outlet stores which have among them Ralph Lauren Polo Store and Bass Shoes. Mammoth has some fine high end stores in The Village with unique items such as leather coats and cowboy hats, boots, ski wear (naturally!) and high end men's fashion. There are art galleries, the Christmas Store, kids fashions, and accessories for your home. Come do some window shopping.